I used to steam my hair regularly back in the day when I trusted hairdressers..hehe!! I saw alot of youtubers and bloggers talk about the Huetiful steamer and I put it on my wishlist. Then 2 years ago at Christmas..I opened a large box from mumzy and yes you guessed it. It was a steamer!! Now you know when you get a new toy and you only use it once or twice before you get bored. Well that is what happened. I used it for about 3weeks and then never again... but..then my hair started screaming for some TLC and it was time to bring it back out. 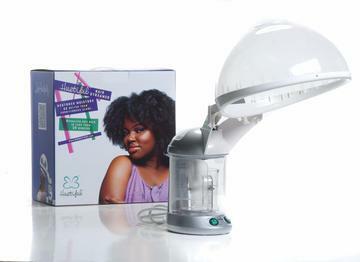 I have been using the steamer every week or every other week and have seen a major difference in my hair. It isn't requirement to natural hair care, but is a luxury treatment,just like a facial. Hi lady.Where in the UK do you order this steamer from.Been searching for a while.